Sunderland boss Jack Ross was disappointed his side let a winning position slip during their 1-1 draw at Kenilworth Road on Saturday. The Black Cats took the lead in first half stoppage time as Josh Maja beat the offside trap to coolly slot past Marek Stech. 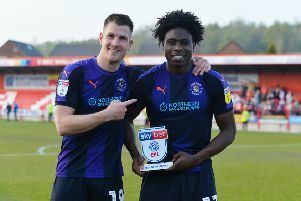 However, Matty Pearson’s 67th minute header ensured that Luton salvaged a point, as speaking afterwards, Ross said: “By nature of the club we have to have an ambition to win every single game, though you won't win every game no matter what club you are. “If you look at it as a starting point, win your home games and collect something on your travels you give yourself a right good chance of having a good season. “It has been a positive start from us. I don't think we could have picked a tougher away game to start the season, their first home game, they are a team on a high from last season. “The game was very much how I expected it to be, and given we are so stretched squad wise, I thought the performance levels and effort levels were good. "There wasn't a lot in the game, we were playing different systems, we understand what they're good at, the pitch is pretty tight here, so it probably negates a little bit of what we're good at as well. “We just looked for that bit of quality and we got it from Josh, so I think that's why the players are more disappointed in there as well. “Because having been in a winning position and being reasonably comfortable, I don't think we were under huge amounts of pressure, and I don't think we were being cut open at any time. Town scored the equaliser from a clever set-piece routine which saw Pearson finish impressively at the far post. Ross added: "Set-pieces are going to be something we have to defend well all season, we weren't cut open that much. “Defensively we have been cut open very rarely. It is well documented we have given up some in height and physicality too. "Overall we defended set pieces really well, the manner of the goal added to the disappointment."